So, when I saw this recipe in The Baking Bible, my curiosity was peaked with Rose’s version. First it was a TART and not a PIE, second it was made with a Sweet Cookie Tart Crust – or a Pâte Sucrée, the fancy French name for it. Then the ration of pecan to filling was pretty high on the pecan – which in my book is a good thing – I love nuts and the more prominent in a dessert the more I gravitate towards it. This recipe has been in the works since early last week. But due to the holiday, not finding pecans, or the tart pan, then having to search over 5 stores to buy the missing pan, then going out again to look for the Golden Syrup it was exhausting. It’s a wonder it got made at all. I was so.over.it even before I started. But today, it all came together. I had made the tart crust the night before using the food processor, because well, it comes together faster than you can clean up the processor. I cannot share Rose’s recipe here, (You can find it here) but I can point you to this source that shows you how easy this is. The only difference is that our version uses Turbinado Sugar, which makes the crust a golden pale brown. Rose does not give you this tip, but I have learn that when you make pie crust or tart crust and it involves butter that needs to be cold, the best thing to do is have everything COLD and I mean everything! I even put the processor bowl and blade in the refrigerator. This tip has yet to fail me, it works every single time to reward me with a perfect well behave dough. The other different thing about this tart recipe is that Rose introduces us to this new method of lining the tart pan, by using an inverted cake pan, then putting the rolled dough on top then placing the tart pan over it and flipping it over she insures the best coverage to the tart. I had to read the instructions a couple of time, and I still did not see the point of doing this, so, I took the lazy way out and I stuck with rolling, then using my rolling pin to unroll the dough on top of the tart pan and it was perfect. I pre-baked the tart and was rewarded with no bubbling, no need to patch up any gaps – so far this was a home run. The filling ingredients were made from Muscovado sugar - Side note here: One of my fellow Alpha bakers is convinced that Rose has stocks in the plastic wrap industry – I think she must also have some in the sugar industry – I have never in my life had so many types of different sugar in my pantry as I do when I’m baking a Rose recipe. Back to the filling, so Muscovado sugar, golden syrup, egg yolks, heavy cream, butter, salt and vanilla. You cook it up until the whole thing becomes thick and caramely-looking. I took it one step further, because when I tasted my filling, it was on the sweet side for me, so I added 3 tablespoons of Cognac and oh boy! Boooozy filling is the best filling folks. Next time, it’s going to be FOUR tablespoons. 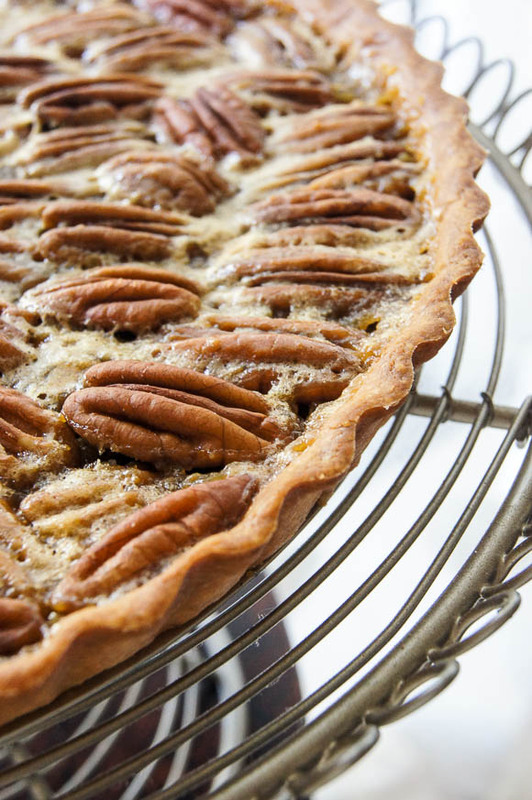 You arrange the pecans in your pre-baked tart, and then pour this perfect filling over them and back in the oven it goes to bake until set. The tart ended up being our afternoon snack. Tom’s family is visiting from North Dakota and we had a full house of tasters. I skipped doing the chocolate Lace Topping, and instead served the tart a-la-mode with pistachio ice cream. We ALL love it. The first thing out of everyone’s mouth was that it was not sickly sweet; it was prefect in every way. 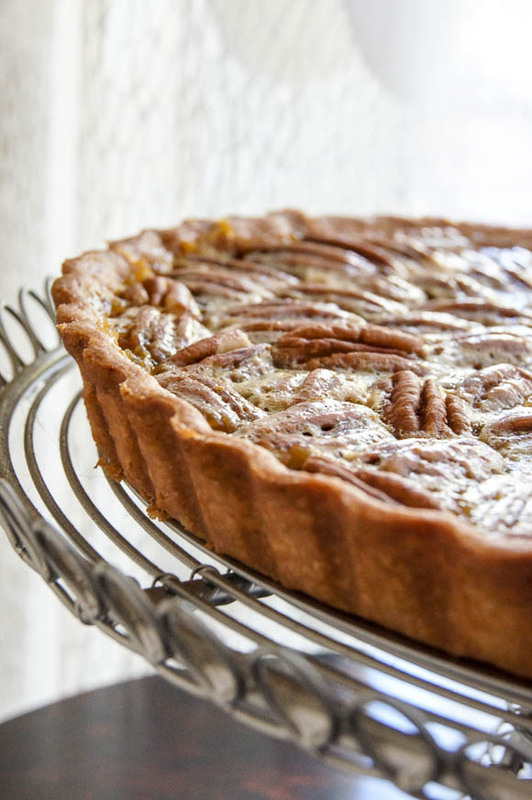 The ratio of the filling with the nuts was just right, making it a nutty tart, one that the main ingredient,the Pecan, took center stage. I could taste the boozy element, which was another complement to the tart. 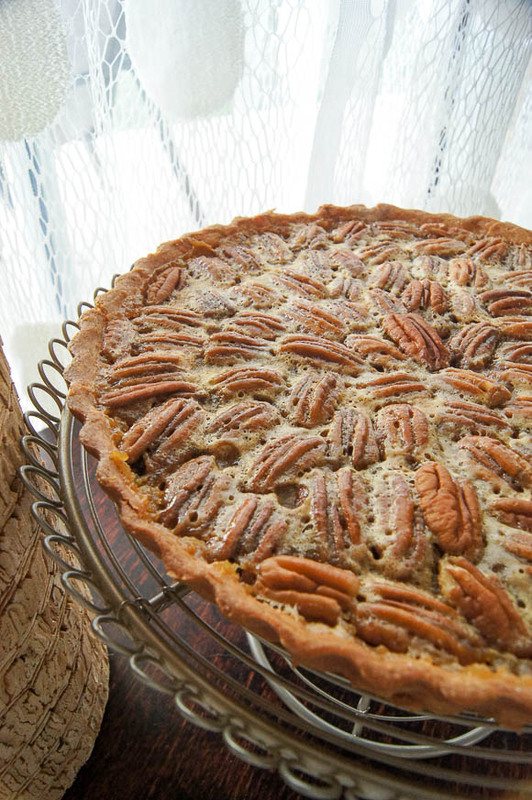 All in all it was a huge success and it has now been marked as the pecan tart to beat.